Fresh Cherry Sauce. 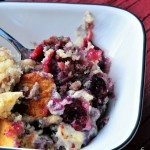 This recipe is ready in just a few minutes and tastes out of this world! I’ve haven’t been able to get enough cherries lately since we left Georgia on our RV trip. I still can find peaches in nearby stores, but the cherries have just been calling my name. Of course, it could have something to do with all of the delicious desserts we’ve had in Williamsburg and then again in DC. And since we’re in the RV, I knew just what I wanted to make to go along with the cream cheese pound cake I baked the other afternoon. This fresh cherry sauce. Oh my gosh, just the thought of it had my mouth watering. This sauce is amazing with everything from yogurt in the morning, pork chops or ham for supper, and (YES!) dessert! It is delicious over ice cream and absolutely perfect with pound cake. I think it would just be great right by itself, to be honest. If you enjoy canning, it sure would make a nice present for the holidays, too. Okay, enough about how wonderful it is. You just need to make it for yourself and see what I mean. 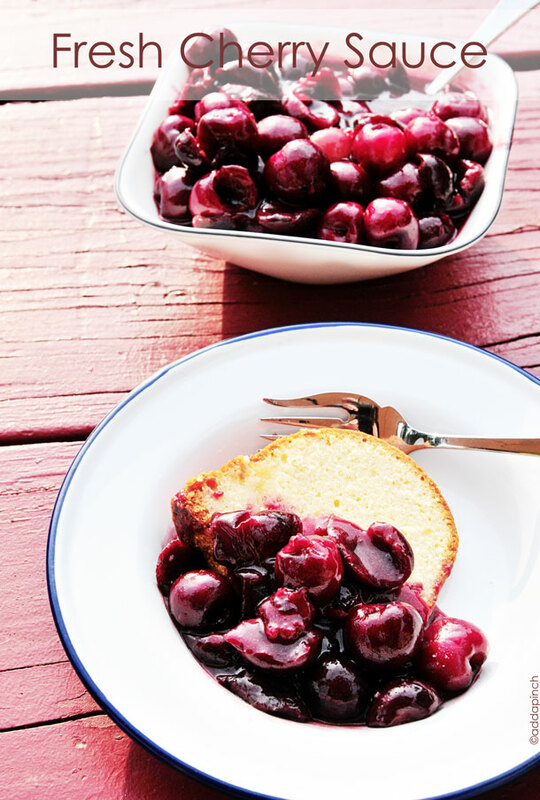 You’ll be singing the praises of cherry farmers all over the land. I promise. 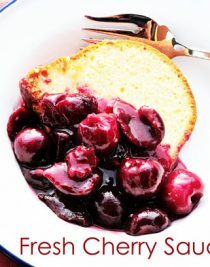 Here’s my Fresh Cherry Sauce Recipe. 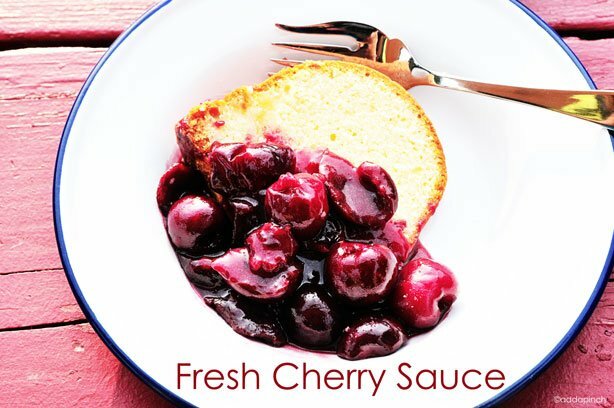 Fresh Cherry Sauce is perfect with both savory and sweet dishes. Add pitted, stemmed cherries to a medium saucepan over medium heat. Add all other ingredients and bring to a boil for about three minutes. Stir occasionally, reduce heat to low and allow to simmer for about two to three more minutes. 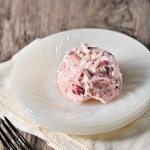 Remove from heat and serve warm or store in an airtight container until ready to serve. Then, warm slightly before serving. Looks perfect. And with pound cake? YUM. What a delicious sauce – so versatile! This is beautiful. The perfect excuse to make a pound cake! I just can’t get enough of fresh cherries. We’re heading up to visit my parents in British Columbia this week and I can’t wait to get my hands on some of the fresh B.C. cherries. This beautiful sauce needs to be on the “must make” list! Oh…I want this on ice cream!! This looks delish! Are they sweet cherries or pie cherries? 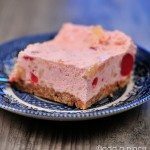 I would love to make this but finding fresh pie cherries around here is impossible. I can still get sweet cherries here. I used sweet cherries, Suzanne. I hope you are able to find them and make this soon. I can’t wait to make a little more and can it for this winter. Yum! 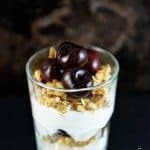 Perfect for my morning yogurt & granola!! Hope you’re having a great trip! 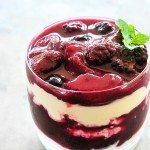 Love cherries and this looks to amazing and fresh! Its my life dream to own an rv! easy enough to me and we have a ton of cherries! Thanks! Can this sauce be frozen ?? For those who asked if this sauce can be frozen: things with cornstarch usually don’t freeze well, so if you intend to freeze it, use arrowroot powder as a thickening agent instead of cornstarch. If you want a little maraschino flavor, add a bit of almond flavoring. 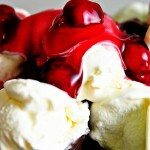 If you are using early or late cherries that aren’t very sweet, you may desire to add a bit more sweetener. And no the butter isn’t really necessary, it just gives the finish product a glossy finish. Coconut oil might add a nice flavor if you don’t want to use cow butter. Can the be canned. Hot water bath or pressure cooker? Why not freeze the berries them make when you want? Just finished making a batch of vanilla ice cream, so I whipped up this awesome sauce to go with it in order to use up a bag of cherries. It tastes great! I did have to google how to pit cherries quickly (I’m in no ways a culinary expert, and have done little with fresh cherries). Since I don’t have a cherry pitter, I used the suggestions from the following video: http://m.youtube.com/watch?v=19Z2T2ECyZA&desktop_uri=%2Fwatch%3Fv%3D19Z2T2ECyZA (the smash technique worked the best. I couldn’t quite get the hang of the paper clip trick, although she makes it look easy!). Can’t wait to eat dinner tonight so I can have dessert! a quick way to pit cherries is with a straw. just push into the cherry from the stem end and the pit pops out the other side. The best way to pit cherries is to use a drinking straw. Just push the straw through the stem end of the cherry and out comes the pit!! Experiment with different size straws. I find it better to use a straw that pushes the pit right through the cherry as compared to the pit ending up inside the straw. I made this and added a little vanilla- too good for words! This makes for fantastic fruit-on-the-bottom yogurt. Also, to put cherries in just two literal seconds, push a (preferably non-disposable) straw straight down through from the spot where the stem connects. Incredibly easy. This looks delish. I made chocolate lovers bundt cake and will be using this sauce as a topping for a potluck tomorrow. Black forest bundt cake…yum! Perfect for my white chocolate vanilla bean cheesecake that im making as a get well present! We have a cherry tree that produces wonderful sweet cherries every year – LOTS of them. They’re shared with neighbors, friends and the packages I freeze are used throughout the winter and into the next summer. Being in western Montana, our fruit trees are later producing, like late July and sometimes even early August. Flathead cherries are highly regarded. With my last package of frozen 2017 cherries I made this sauce to serve with a slightly tart cheesecake and it was an enormous success with everyone. It’s a keeper and will become a dessert standard. Loved it. Easy and so delicious on ice cream. Thanks so much! Glad you liked it, WC! How long will it stay refrigerated? I’m glad you liked the cherry sauce, and am sorry it wasn’t thick enough for you. I am wondering what could have happened that caused you to need to add more cornstarch. I’ve never had an issue happen where I needed to do that and it always turns out the right thickness when following this recipe.